As you know, we have spies everywhere, swiveling their wet, glistening little eyeballs hither and fro, looking for interesting cars. 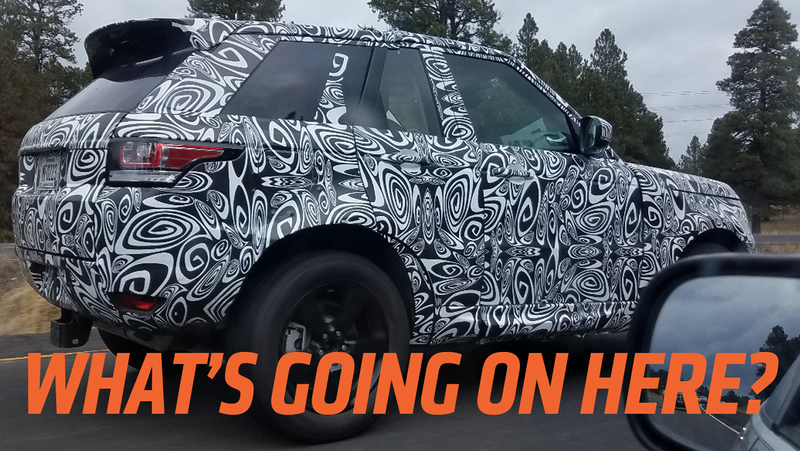 One of our volunteer reader field operatives, Andrew, sent us some fascinating pictures of a very disguised Range Rover mule or prototype of some sort. Note the odd proportions of the car, and the size of those rear doors. What’s going on here? The proportions are interesting, perhaps suggesting that this is a mule for a new Range Rover two-door coupé, like the SV Coupe they sell now. The taillights and headlights seem closer to the Range Rover Sport, though. Perhaps they’re planning a coupe model below the SV Coupe, and above the Velar and Evoque? Or, maybe that funny little rear door is part of the actual design, not a vestigial, welded-shut bit on a mule with a cut-down wheelbase, and it’s going to open suicide door-style, like a Honda Element or a 2008 Mini Clubman? Maybe those doors drop down like ramps! Maybe they flip up like wings! Anything is possible! Whatever it is, it’s wearing Minnesota manufacturer plates and, according to Andrew, has a “really fat muffler/exhaust operation.” If anyone has any ideas what this stubby Range Rover thing may be, I’m listening. We reached out to Jaguar Land Rover, and, shockingly, they declined to tell us anything about it. Oh well. Worth a shot!